Blended with Citrus and a hint of Spice, this Infusion will refresh your spirit and transform your hair. Clients routinely report that this is one product they are unwilling to live without. Hand blended with organic oils of Argania spinosa (Argan Oil), Prunus amgdalus dulcis (Sweet Almond Oil), Calendula officinalis (Calendula Flower), Tocopherols (vitamin E), and the purest essential oils of Cymbopogon (Lemongrass), Citrus sinesis (Sweet Orange), Matricaria chamomilla (Chamomile), Citrus Limon (Lemon), and Zingibar officinale (Ginger). Lemongrass Essential Oil — Cymbopogon citratus or lemongrass is an herb that has been in use for years in traditional Indian medicine. 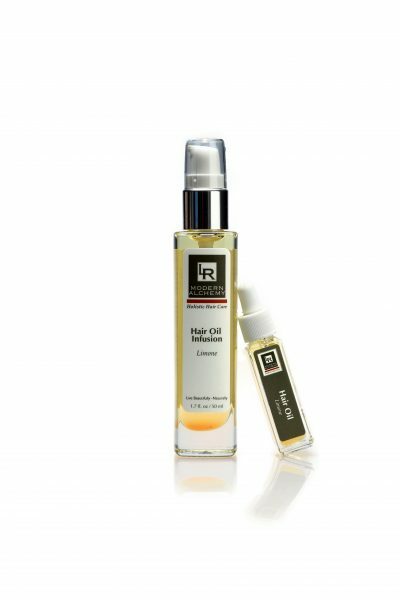 Some aromatherapists believe that Lemongrass oil can strengthen the hair follicles, another benefit for those suffering from thinning or weak hair.